The Australia ball-tampering scandal took another twist on Thursday after it was confirmed head coach Darren Lehmann will resign following the fourth Test with South Africa. That clash at the Wanderers begins on Friday and will conclude a desperately sorry saga for the tourists, who have seen captain Steve Smith, vice-captain David Warner and opening batsman Cameron Bancroft all suspended and sent home. Bancroft was found guilty of attempting to change the condition of the ball during day three of the third Test at Newlands, which the Proteas won convincingly to take a 2-1 series lead ahead of the final instalment in Johannesburg. 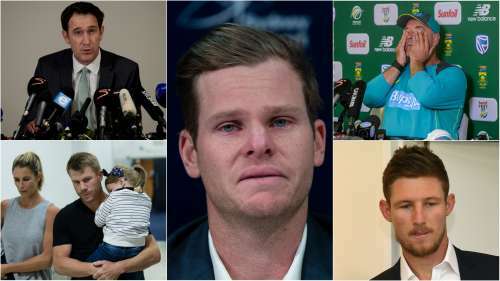 A Cricket Australia (CA) investigation found Smith and Warner to have been part of the plot and the fiasco has rocked the cricketing world, with current and former players - as well as prominent politicians - quick to have their say. Below, we recap how the events of the last six days unfolded. March 24: Television replays begin to emerge of Bancroft rubbing the ball with sandpaper, which he then hides down the front of his trousers. March 24: Bancroft and Smith face the media after the day's play, admitting - along with the "leadership group" - their plot to manipulate the ball, although they claim the foreign object was tape. Bancroft confirms he has been charged by the ICC while Smith insists he will not resign as skipper. BREAKING: Steve Smith has been fined 100% of his match fee and handed a one Test ban, Cameron Bancroft a 75% fine and three demerit points for ball-tampering incident. March 26: CA officials travel to South Africa to investigate. Smith stands down as captain of IPL franchise Rajasthan Royals. March 28: Warner follows Smith in stepping down from his captaincy role in the IPL, with Sunrisers Hyderabad. March 28: CA hands Smith and Warner one-year bans from international and domestic cricket. Bancroft is suspended for nine months, while Warner will not be considered for any leadership roles in future. James Sutherland, CEO of CA, reiterates that Lehmann knew nothing of the plan. It is confirmed Bancroft used sandpaper and not tape on the ball.